This program is conducted in a VIRTUAL LIVE instructor led environment and you can participate from any location with a computer and internet access. The University of La Verne is recognized by SHRM to offer the SHRM California Law HR Specialty Credential program. This course is ideal for anyone who deals with employees in California, by providing directions for navigating the complexities of California Employment Law. For the HR Professional, this program and micro-credential will distinguish you from others in this field while at the same time earning 25 PDCs for your existing SHRM CP/SCP certification. Participants may include, but not limited to HR Professional, HR Administrators, Administrative Assistants, Executive Assistants, Office Managers, and Small Business Owners. Accurately apply California benefits and worker’s compensation rules and regulations. Adhere to key regulations impacting employee/employer relations in California. Interpret and apply California employment regulations regarding security, safety, and privacy. 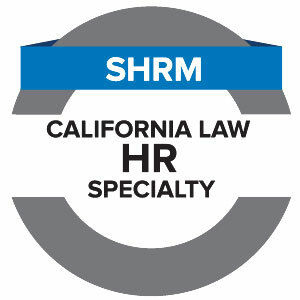 You do not have to be SHRM-certified to earn the SHRM California Employment Law Micro-Credential; however, you will receive 25 PDCs toward your SHRM-CP or SHRM-SCP recertification upon completion of the Micro-Credential package. The University of La Verne is recognized by SHRM to offer Professional Development Credits (PDCs) for the SHRM-CPSM or SHRM-SCPSM. This SHRM California Employment Law Micro-Credential program is eligible for 25 SHRM-CP/SHRM-SCP professional development credits (PDCs) for the SHRM-CPSM or SHRM-SCPSM. For more information about certification or re-certification, please visit www.shrmcertification.org. Lunch and Learn - Live Virtual via Cisco Telepresence Virtual Classroom from your office of any internet location via WebEX! Saturday and Sunday - Attend in person at our Ontario Campus or via our Cisco Telepresence Virtual Classroom from any internet location via WebEX! *Please ask about discounts for La Verne alumni, current students, veterans and corporate partners.